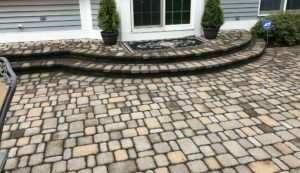 Paver Cleaning will take away the years of grime, mold and other items that have taken away the beauty of your pavers. You spent a lot of money to put in your walkways and patios and it is time to breathe life back into them. Our process starts with our men removing any weeds and general debris from in between your pavers and on them. After that, we use a Power Broom to clean the pavers and remove as much as possible from the pavers themselves. After that, we use a Power Washer and finish cleaning between pavers and washing away any additional items. 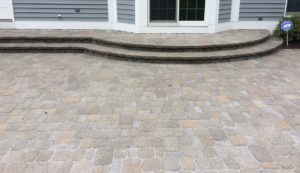 After this, we let the pavers dry a day so we can come back and apply Polymeric Sand between the pavers. This adheres the pavers in place and prevents weeds and insects from growing between them. After the Polymeric Sand hardens overnight, we may apply, if wished, a sealer to the patio. We offer a High Gloss and a Low Luster, depending on your preference. Take a look at our Gallery to see what a difference this can make! "What a pleasure to view from our windows a beautiful green lawn. We can actually walk on healthy grass in the front and backyard. Because of your professional assessment through the growing seasons, we have a well-established lawn. There's even grass growing in particularly difficult and shady areas. We look forward to your continued visits here. Thank you."